Looking for a wow factor in your next design? Look no further than So Silk. A sensuous, high end stock inspired by the glitz and glamour of the fashion industry, So Silk card stock is nothing less than chic and the best choice for dressing your most important, statement making projects. 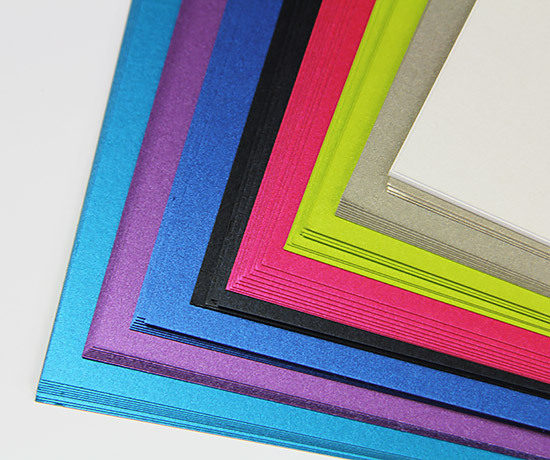 Card stock is heavy, dense, 130lb cover with an ultra smooth, silky, lustrous finish - thanks to actual silk fibers and some serious pigmentation! So Silk is offered in eight bold, highly saturated colors, each featuring a metal-infused iridescent effect and a name worthy of the fashion industry. Make your project pop with colors like Glamour Green, Beauty Pink, Black Style, Vanity Pearl, and more! 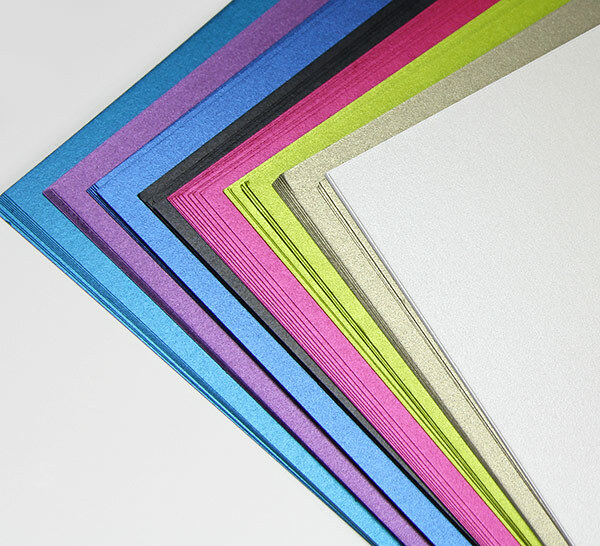 Paper is offered in a variety of popular pre-cut sizes, and matching So Silk invitation envelopes are available. Due to the very heavy weight and offbeat finish of this paper, we recommend reviewing your printer specifications or consulting with your printer manufacturer before attempting to print. In our in house tests LCI did successfully print So Silk card stock using a laser printer, however roller impressions from the printer was evident. So Silk is suitable for offset, letterpress, thermography and many other conventional printing applications. 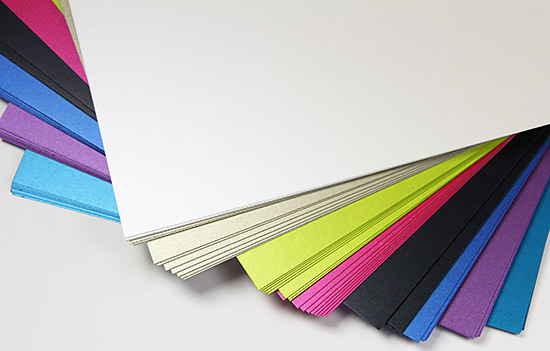 So Silk paper is made in Italy by long-standing fine paper manufacturer Gruppo Cordenons. So Silk is Elemental Chlorine Free, pH Neutral, and is completely recyclable and bio-degradable. Can I inkjet print So Silk paper? We test printed a number of the So Silk colors using quality Epson and Canon inkjet printers. Based on our test results, we cannot generally recommend inkjet printing with So Silk papers. While the text appeared sharp and defined on the sheets, due to the coating, the ink did not adhere. Even after allowing for a generous drying period, the ink easily smudged when we ran our fingers over the printed text. It is possible that with certain manufacturer's inks and a longer drying period, some may be able to achieve satisfactory results from inkjet printing, but achieving good results would certainly require ample testing. So while we can't recommend these sheets in concert with inkjet printing, we would not discourage you from ordering samples and performing test printing on your own printer(s). Is the So Silk Color and finish on both sides of the paper? Yes, The same color and finish are used on both sides of the So Silk sheet. What shade of green is Glamour Green? Just as seen in the product images, Glamour Green is a shade of teal, or blue green, not a traditional shade of green as some feel the name implies. Why doesn't this stock feel like other 130lb card stocks? This card stock is in fact a 130lb card stock. This weight refers to the density of the paper, not necessarily the thickness. Because this sheet is heavily pressed and embedded with real silk fibers it does have more mass per sheet than the rest of our paper stocks. Due to this paper's unique finish and textile like properties it lends its self to have a certain pliability that requires a first hand touch in order to get a full sense of the paper. Featuring a sensuous silky finish and a bold, iridescent color pallet like no other, So...Silk is an exciting new line of paper at LCI Paper. With colors like Glamour Green, Fashion Purple, and Vanity Pearl, the idea behind So...Silk is to "dress your projects in luxury and elegance" - and that it does. When was the So...Silk line launched? So...Silk was officially launched as part of the Boutique line in March 2010 here in the Unite States. The extravaganza took place at the luxurious Four Seasons Hotel in New York City. It is a part of the Boutique line; a line of cool colors and amazing materials in the new range of textile papers from Gruppo Cordenons. More about the So...Silk Boutique Line? Boutique, the new range or papers, is inspired from the fashion world and from the tactile and visual sensations of fabric. Within the Boutique line, there are three individual lines. So...Silk is a special silk-like paper characterized by a particularly soft touch and by a light iridescence, that, depending on the observation angle, will have a subtle color shift. So...Jeans is a felt marked paper, made with cotton fibers, with a special off-line treatment on the surface that gives a particular denim effect. It really looks like jeans. So...Wool is a proper fabric paper made with both wool and cotton fibers. Together they create a distinguishable texture and a special toothy touch. It's like someone took your favorite wool sweater and turned it into paper. What has been consumers' general reaction to So...Silk? So far the response has been great! With three weight options - 81 pound text, 92 pound cover, and 130 pound cover - and eight fashionable colors to choose from, it's hard to pass up. The distinct surface has a silky eloquent look. Join this with the soft and surprisingly supple body of the sheet and you have a winning combination that's hard to resist. Note: LCI only carries 130 pound cover. What are popular trends or uses of So...Silk? So...Silk tends to move in the direction of social announcements, invitations and envelopes like many of our products. We also see the line being used in a variety of other markets as well, such as packaging and commercial printing. What is responsible for So...Silk's amazing finish? Being manufactured in Italy, the secret is in the sauce. Cordenons produces coatings that are technologically challenging. The ingredients make it soft and smooth. Like all Gruppo papers, So...Silk is manufactured with eco-conscious practices. Gruppo Cordenons' products are recyclable, and more than 80% of our cellulose comes from either ISO 14001 or FSC-certified companies to guarantee that our pulp comes only from responsibly-managed forests. 100% of our mills' energy needs are met from clean-burning natural gas. In addition, all of Cordenons' products are manufactured in an ECF (Elemental Chlorine-Free) environment. 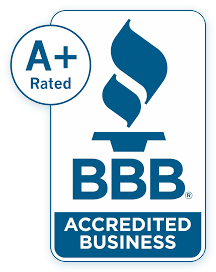 Like most Cordenons' products, So...Silk is acid free, pH neutral, archival in quality, and utilizes chlorine free pulp. Our products are also certified heavy metal free.